Trump says he loves miners. Critics say he's putting their lives in danger. WASHINGTON — President Donald Trump has gone to extraordinary lengths to bolster America's mining industry, rolling back environmental regulations, appointing mining executives to high-ranking jobs and funneling more money to struggling coal plants. "We’re going to fight for you like I promised I would in the campaign," the president told a group of miners in February, assuring them that his agenda would bring back coal jobs. "And you were very good to me, and I’m going to be even better to you, I promise you that." But the Trump administration is also taking steps to delay, modify and roll back Obama-era safety measures intended to protect mine workers. It's delaying a rule requiring that certain mine operators conduct safety inspections before workers begin their shift. It wants to drop a provision that these operators have to document workplace hazards, so long as they're corrected quickly. And miners' representatives worry they're being shunted aside during certain agency visits. Industry groups have applauded the recent moves, claiming the policies currently being targeted are onerous and unnecessary. But worker-safety advocates and labor unions fear that the moves could put miners at even greater risk of injury and death in what is already one of America's most hazardous lines of work. While coal miners are the public face of the industry, most American miners work for operators who extract iron ore, stone, gravel, copper and other substances. Just days before leaving office in January, President Barack Obama finalized a new regulation that requires these mines — commonly referred to as "metal and nonmetal" operations — to inspect the workplace for hazards before miners begin their shifts; promptly notify miners about any adverse conditions; and provide detailed documentation of the conditions and the actions taken to correct them. The Mine Safety and Health Administration (MSHA) — Trump's nominee to head the agency is set for a confirmation vote in the Senate on Wednesday — has repeatedly delayed Obama's worksite inspection rule from taking effect, announcing in October that it would push the start date to next June. The agency also proposed significant changes to the rule that would allow mining operators to conduct safety inspections"as miners begin their work" — leaving it up to the company to decide the timing, rather than requiring that the inspections take place before a shift begins. Labor unions and other worker advocates have decried the moves and say the administration's proposed changes defeat the rule's basic purpose. "You ought to know about hazards before the shift starts — not three hours later," said Mike Wright, director of health and safety for the United Steelworkers. In July, a miner in Georgia was crushed to death by a nine-ton piece of granite that he was trying to break loose, according to a preliminary accident report. After the fatality, MSHA advised mine operators to "always conduct examinations of work place to identify loose ground or unstable conditions before work begins, or as changing ground conditions warrant." Currently, MSHA requires operators to conduct workplace safety inspections at least once during a shift, but they don't have to be completed within any specific time frame. The Trump administration is also trying to eliminate the requirement that operators document hazardous workplace conditions during inspections, as long as they're corrected promptly. Wright believes that would make it more difficult to see if there's a pattern of dangerous conditions in the mine, or to determine if operators failed to do enough to correct hazards they knew about. The Labor Department established MSHA in 1978 after two explosions killed 26 coal miners in Kentucky, prompting Congress to pass legislation to strengthen oversight of miners' health and safety. The agency now has a staff of about 2,000 and a 2017 budget of $375 million. Federal law has long required all underground coal mines to conduct pre-shift inspections, and supporters of the Obama-era rule believe that similar rules should apply to metal and non-metal mines, too. Analyzing the deaths of 122 metal and nonmetal miners from 2010 to 2015, the Obama administration found that 18 miners were killed in accidents where operators were cited for “unwarrantable failure" to comply with federal law. Had operators kept more detailed records of worksite hazards — as is required under the Obama rule — they might have addressed them more promptly, potentially preventing the fatal accidents from happening in the first place, Obama's Labor Department concluded. Industry groups have welcomed the delays under Trump and proposed their own modifications to the mine inspection rule, having spent years battling the Obama administration on the issue. The National Sand, Stone and Gravel Association (NSSGA) — one of the most vocal opponents of the regulation — said it "risks creating a paperwork nightmare and pulls the focus away from actually improving safety," said spokesman Bailey Wood, claiming that the rule would cost small operators up to $25 million a year to comply. The trade group has spent $300,000 to lobby against the inspection rule and other policy issues from January through September, according to disclosure reports. In March, NSSGA featured Corey Lewandowski, Trump's former campaign manager, as the keynote speaker at its annual convention. In June, the group detailed its complaints about the inspection rule in a meeting with Labor Secretary Alexander Acosta, describing it as vague and burdensome and the kind of "regulatory overreach" that Trump had vowed to eliminate. "We let Secretary Acosta know that our industry wholeheartedly supports advancing President Trump’s ambitious agenda," said Laura O’Neill Kaumo, a NSSGA lobbyist. A few months later, the Trump administration unveiled its industry-friendly changes to the rule and a delay of its effective date. "It appears that MSHA is willing to listen to the industry," O’Neill Kaumo said after the announcement. NSSGA, together with other major industry groups, subsequently decided to put its lawsuit against Obama's version of the rule on hold. Asked about industry's influence on its decision to delay the new inspection rule, a Labor Department spokesman, Eric Holland, said the Trump administration is committed to hearing from "a variety of stakeholders on a range of matters." The administration added that it is already helping to train and educate miners about the new regulation, claiming that additional time is needed to clarify the rule and prepare the industry to comply with it. Industry groups remain hopeful that MSHA will continue in a direction they consider favorable. "Where I think we’ll see a change going forward — not just at MSHA but reflective of the administration’s overall philosophy — is less focus on regulations," said Bruce Watzman, a senior vice president at the National Mining Association. NSSGA has already pinpointed the regulations that it wants to roll back next, and the Trump administration seems ready to listen: MSHA is asking the public to identify regulations "that could be repealed, replaced or modified" to help carry out the president's deregulatory agenda. Industry lobbyists say that Obama's mine inspection rule is not only costly and burdensome, but alsounnecessary: Injury rates in mines have been steadily falling, as has the fatality rate in metal and nonmetal mines. At the same time, there's been a rise in coal-mining deaths after years of decline: Fourteen coal miners have died so far this year, compared with eight in 2016. In one incident in February, a 62-year-old foreman in West Virginia was crushed to death by large falling rocks. MSHA later said the accident occurred because the pre-shift inspector had failed to identity that the mine roof was poorly supported. 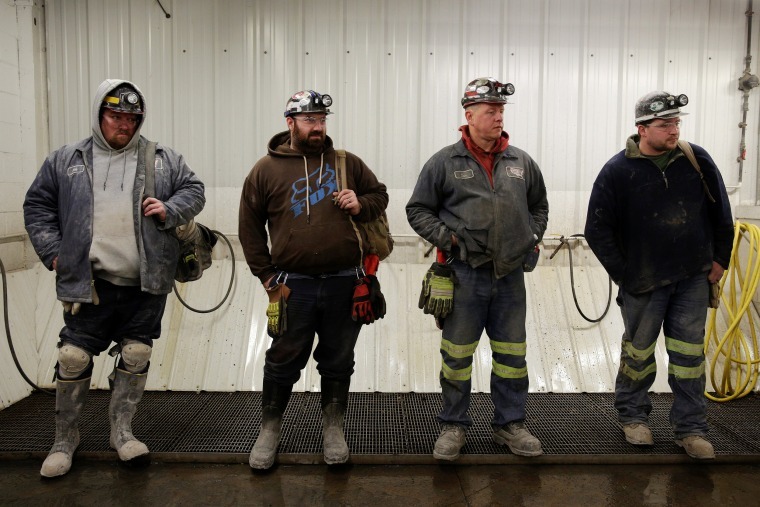 Worker-safety advocates say there are early signs that the Trump administration isn't responding effectively to the spike in deaths, putting miners at greater risk by going soft on potential bad actors. In June, MSHA started a new "compliance assistance" program that would provide additional training and support for less experienced coal miners, who are at higher risk of being injured on the job. The Obama administration ran similar educational programs, but critics say there are some troubling differences. Under the program, MSHA officials are being told to leave their inspection credentials behind before entering mines to conduct compliance assistance, which means they can't issue citations on the spot if they see a safety violation or other hazards. "The inspectors have no ability to enforce the law," said Phil Smith, a spokesman for the United Mine Workers of America, the leading labor union representing coal miners. Sen. Joe Manchin, D-W.Va., echoed the union's concerns in a letter to the Trump administration, pointing out that MSHA inspectors are required by law to carry their credentials to be able to enforce the law. If they leave them behind, "one is essentially removing the ability of that inspector to issue an order to remove miners from the unsafe area and issue a violation which, particularly in the event of an imminent dangers, can prove perilous," Manchin wrote in September. Under the program, miners also do not have the right to designate their own representatives to accompany MSHA officials during compliance visits, as is required by law during official inspections. "This is particularly alarming because no one is better suited to spot inconsistencies or unsafe conditions than the very people who work at the mine day in and day out," Manchin said. The Trump administration describes the compliance visits as an extension of an Obama-era program. "The initiative you point to is within the Compliance Assistance Program, which started in 2016," said Jeffrey Grappone, a Labor Department spokesperson. The department says there's a difference between compliance assistance — educational and training efforts — and legally mandated mine inspections that are the backbone of the agency's enforcement efforts. MSHA officials carrying out compliance assistance "are not considered authorized representatives or inspectors," Holland said, explaining why the agency believes that they should leave their credentials behind and don't need miner reps to accompany them. The agency is still encouraging mine operators to permit miners' reps to come along on the visits, as it did under Obama, the Labor Department added. Union leaders remain concerned: Previously, if MSHA officials left their credentials behind, miners' reps would be allowed to accompany them, or else the visits just wouldn't happen, said Smith. Some advocates believe these early initiatives are a sign the Trump administration is more interested in going easy on the mining industry than punishing companies who put their miners at risk. "The whole theory behind ‘compliance assistance’ is that mine operators are good guys and all they need is a little bit of help to better understand what their obligations are," said Tony Oppegard, a miner's rights attorney and former MSHA inspector. Previous Republican administrations also emphasized "compliance assistance" over enforcement, said Oppegard. While mine safety improved by certain measures under George W. Bush, there were also mining catastrophes after the agency took a more industry-friendly approach. "The last time we went down the compliance assistance road was right before the Sago mine explosion in West Virginia," said UMWA's Smith, referring to the 2006 disaster that killed 12 coal miners. Both supporters and critics of the policy shifts under Trump say the real test is yet to come, as MSHA still doesn't have permanent leadership in place. Trump didn't choose his nominee to lead the agency until early September, and the president's pick — former coal executive David Zatezalo — is expected to have a confirmation vote in the Senate on Wednesday. Wayne Palmer, a former GOP congressional aide and Labor Secretary Acosta's chief of staff, is the acting head of the agency. The retired chairman and CEO of Rhino Resources, Zatezalo has faced criticism for Rhino's record of serious health and safety violations under his leadership. In 2011, a coal miner was killed by falling rock in a Rhino mine that MSHA had just put on its "Pattern of Violations" list — one of the agency's toughest enforcement actions. Shortly after the death, MSHA sent a second violations notice to Rhino, saying the company had failed to maintain earlier improvements in health and safety. MSHA issues such sanctions only to mines "that pose the greatest risk to the health and safety of miners," the agency has said, and it's rare for a company to receive two notices. Rhino's record prompted Manchin — one of the coal industry's most vocal advocates — to come out against Zatezalo's nomination. At his confirmation hearing before the Senate Committee on Health, Education, Labor and Pensions, Zatezalo blamed local managers for the violations and said he replaced them soon afterward, noting that his company did not contest the sanctions. "I did not try to lawyer-up and stop anything from happening," he said. "If you haven’t done your job, we should be big kids and deal with it as such." Zatezalo insisted at the hearing that he would continue the agency's efforts to conduct mandatory inspections and enforce new Obama-era rules on coal dust. (MSHA is legally required to inspect every underground mine four times a year, and every surface mine twice a year.) He also stressed the need to investigate the impact of silica dust on miners' health, given the recent rise of black lung and silicosis among workers. Those remarks encouraged worker advocates who have criticized some of the recent policy shifts at MSHA, though they stressed the need to remain vigilant. "He said a lot of good things in his confirmation hearing, that he wasn't interested in rolling back regulations," said Smith, of the United Mine Workers. "But the proof's got to be in the pudding — we'll be keeping an eye on that."